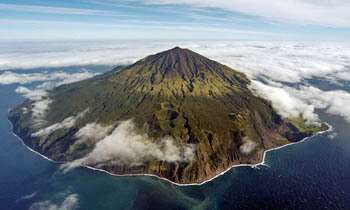 and later in Tristan da Cunha Tourism Department Leaflets published in liaison with the RSPB. 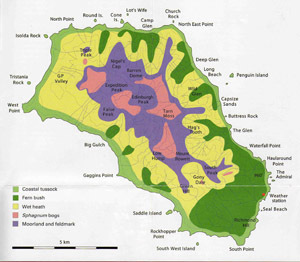 has concentric zones based on the conical shape of the active volcanic island with pastures at the base of the fringing coastal cliffs on the Settlement Plain, The Caves, Stony Hill and Sandy Point. 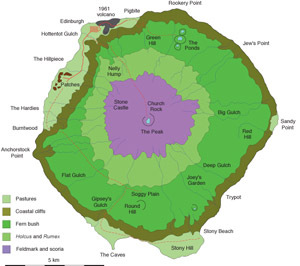 Above the cliffs lies the extensive Fern Bush zone, above which are grassy slopes and on The Peak limited vegetation amongst scoria. is dominated by Spartina Tussock Grass (now absent but once the dominant lowland vegetation on Tristan before settlement), with significant patches of Phylica woodland, also still present in large areas of eastern Tristan, but not shown on the map opposite. 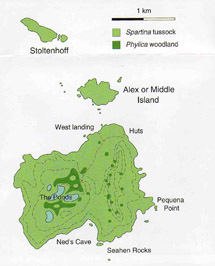 The satellite islands of Stoltenhoff and Alex or Middle are dominated by Spartina Tussock Grass. 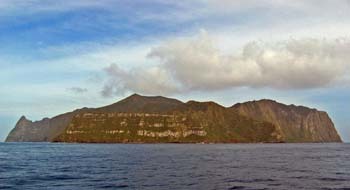 Tristan da Cunha's concentric volcanic cone showing the central Peak with sparse vegetation on the ash slopes, a ring of grass slopes then giving way to the dense Fern bush of the lower Base. To the left above Sandy Point, Fern Bush is intermixed with stands of Phylica woodland, denuded for firewood by Islanders nearer the Settlement, but now recovering on cliffs and on The Base. Photograph of Nightingale Island looking south-west showing the Spartina Tussock Grass dominated landscape rising to High Peak. Hidden in the interior is The Ponds and areas of Phylica woodland. 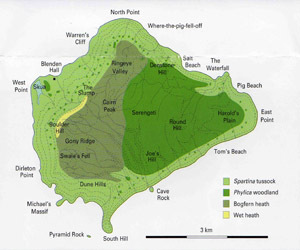 is fringed with a zone of Spartina Tussock Grass dominating the limited lowlands and cliffs, the uplands plateau has two distinct zones dominated by Fern bush heath in the west and by Phylica woodland in the east. has more complex vegetation zones. A narrow coastal cliff fringe of Spartina Tussock Grass gives way to Fern bush heath, especially in the south-east, but interspersed with wet heath in other areas. On the higher moorland landscape a wet heath vegetation is capped by areas of feldmark with a sparse plant cover similar to the Tristan Peak. and showing the sheer sea cliffs with bare rock interspersed with Spartina Tussock, with the central plateau beyond dominated by vegetation of Bog fern heath and Phylica woodland. 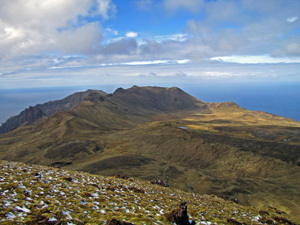 Photograph from John Cooper taken from the top of Edinburgh Peak on Gough Island looking south-east towards Mount Rowett. Typical feldmark vegetation is shown in the foreground with wet heaths occupying the hollows beyond and the darker patches are of Bog fern heath.